You may not realize this, but we deal with simple molding all the time in our daily lives, including the ice we put in our drinks which each piece of ice has been molded from the tray’s shape the water took as it was being frozen or to the cup cakes we eat that have been formed as the cake batter rose and fluffed in the oven inside it’s paper cup. The mold process has been throughout history in human civilization with ancient weapons making when molten bronze was pored in a hollowed out sword shape out of stone; and even nature has produced some amazing natural molds with fossils embedded in rocks of extinct plants and animals. 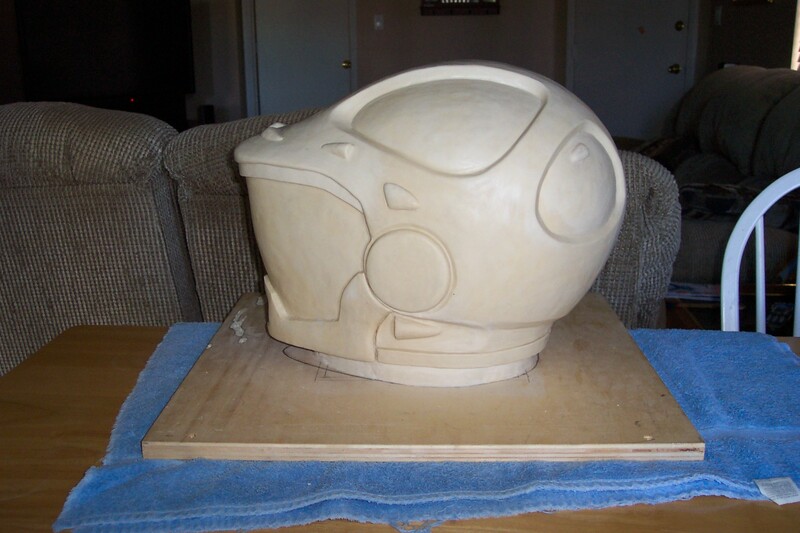 Making a mold of your sculpture or object you need for your next project is the best way to preserve what you’ve captured and a way to be able to rapidly produce several pieces you need repeated multiple times over (i.e. scales, horns, spikes, or fake bullets). 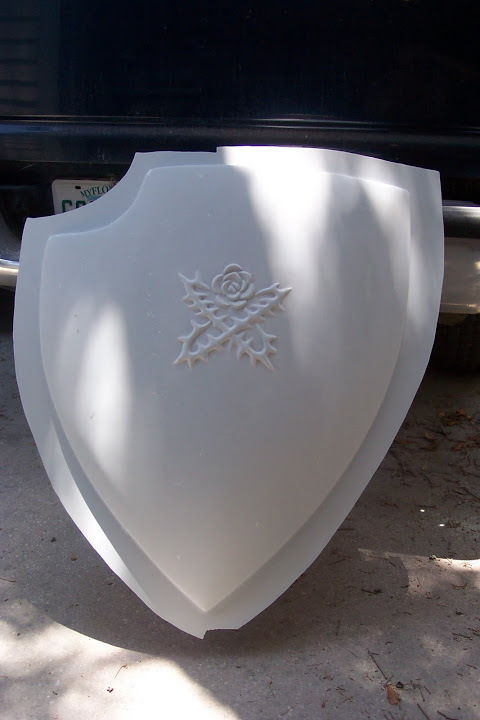 I’ve used it as a way to be able to make armor out of a different/lighter material than what real metal armor would be or even to make what I need stronger and more durable than foam would be. 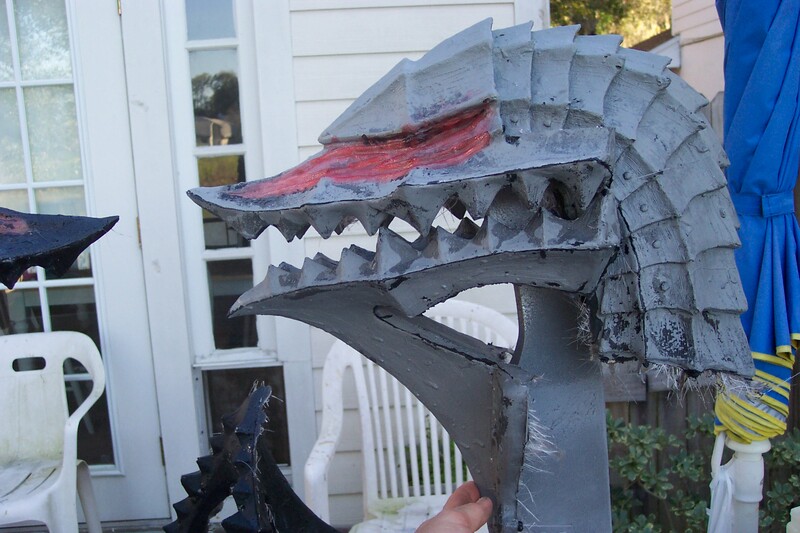 And if any piece of a finished armor build breaks or doesn’t last, I have a mold to make another one without re-sculpting it. 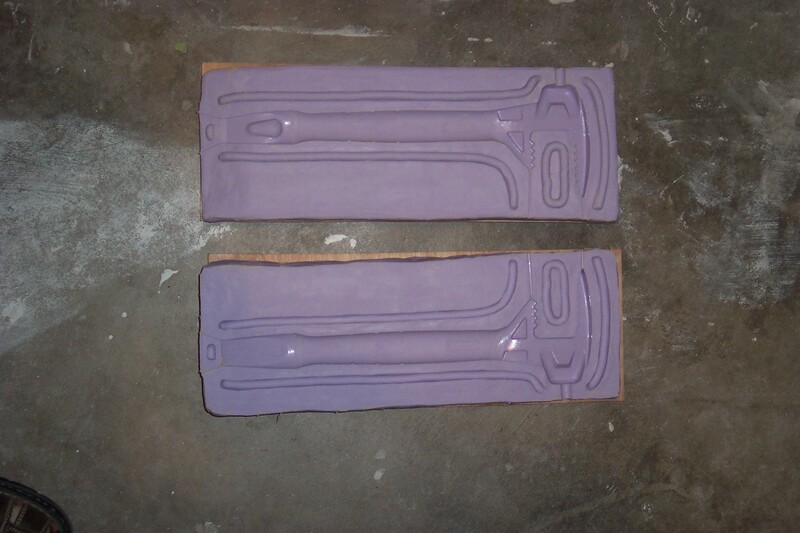 Poor molding can be one of the fastest and easiest ways of making molds of your artwork or object you need mass produced. 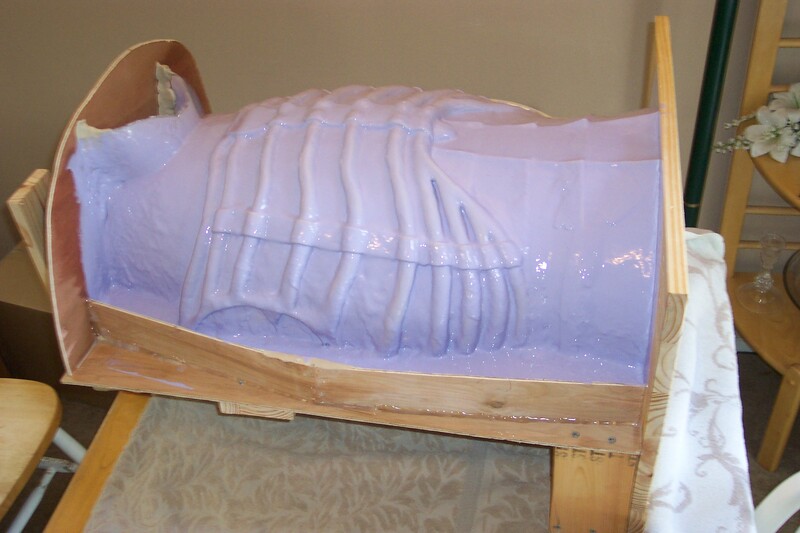 Typically the material used as the mold substrate is a liquid rubber such as silicone and/or a urethane based rubber. The liquid rubber starts off runny and by adding and mixing a said amount of catalyst or hardener is what makes it eventually become hardened flexible rubber. The decision to make a poor mold is based on how simple and or symmetrical the shape of what it is your trying to mold is. For instance, if it has a flat surface to it and isn’t too tall or complex, glue it to a board, build some dam walls around it, spray mold release on the piece and then poor the mold. A poor mold can be a little more complicated as a two part mold, meaning there is two halves to it as the piece to be molded is shaped and detailed all around as you’ll see in the galleries below. 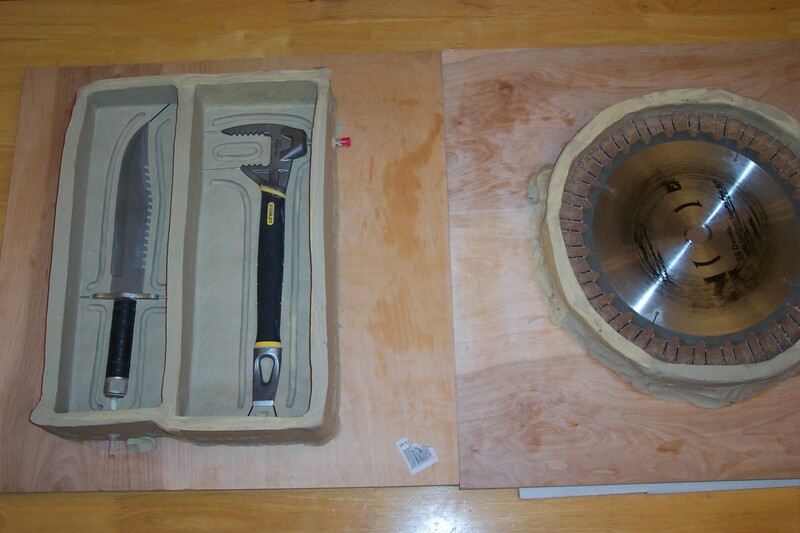 There you’ll find some tools and knives that I’ve made molds of for movie props made to be safer for stunt use. The advantage with a rubber type mold is the flexibility to facilitate releasing a finished piece out and the incredible amount of detail it accurately captures after hardening. There is always the pesky air bubbles, however, that manages to find its way to hinder the process which I’ll be addressing a little later down the article. shaped to be considered for a poor mold; whereas it would take way too much liquid rubber to complete a mold that was pored. Brush mold becomes smarter and more cost effective because of the control you have on where exactly the rubber goes and how thick. 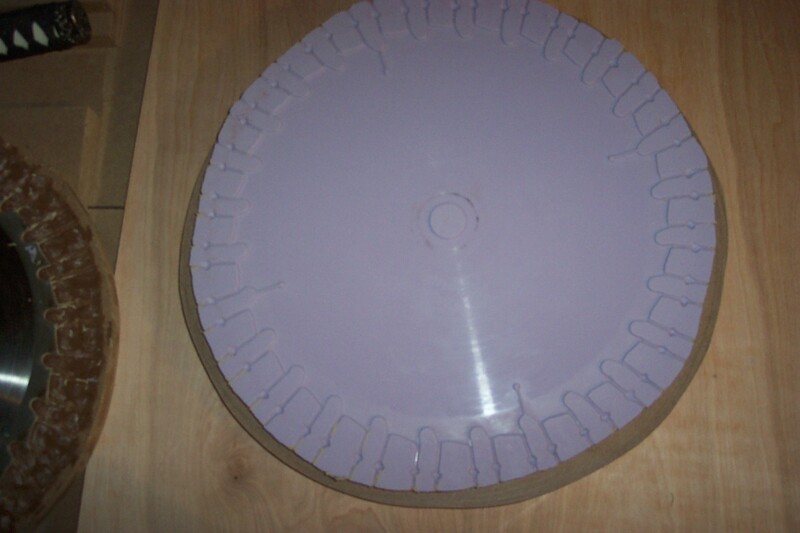 There is one extra important step when building a brush mold where after the final layer of rubber is applied and hardened, and that is to make a hard (typically fiberglass) layer to the outside or on top of the last keyed rubber layer at the end to help hold/cradle the rubber to shape when the mold is empty. This is called a mother mold. 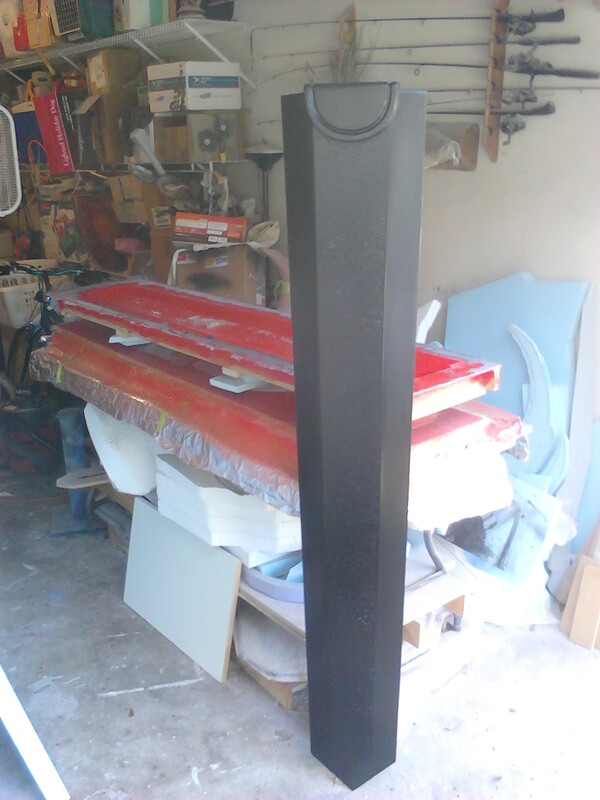 It usually takes a minimum of three layers of brushed on mold material to acquire desired thickness. The first layer is brushed on as a skim coat without any thickening agent added so the thin material can get into any fine detail easily. The second, third, and any other layer has the added thickening agent mixed into the rubber to help hold the substrate in place without running off the piece. 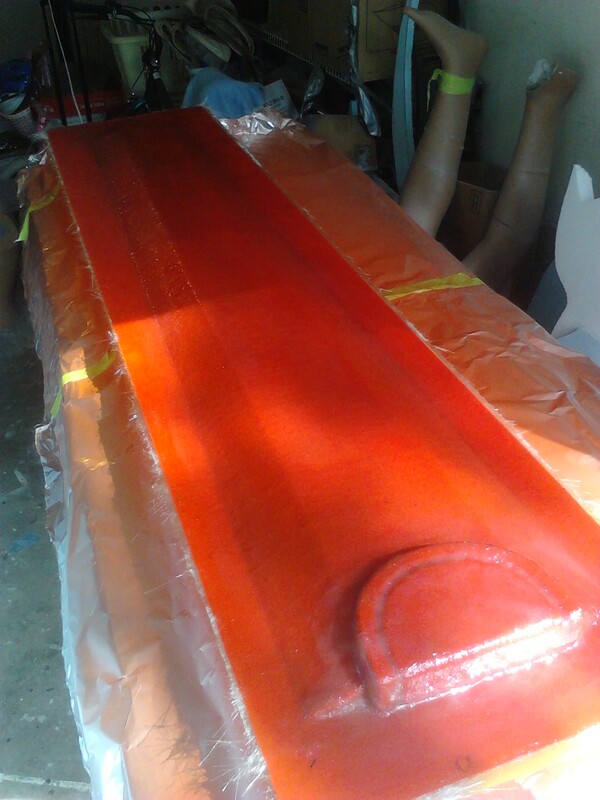 Above, in the list, I mentioned keys to be apart of the last step in the liquid rubber phase of the mold. Keys are a button, or knob shaped mini protrusion from the mold to help locate exactly how the mother mold will fit every time the rubber is placed back into it’s cradle of the mother mold to define the shape as an empty mold. keys are also a term used for a channel, button, or knob that will be part of the break wall if the mold is separated into two halves or more to help relocate exactly how the mold will fit back together again. The better the key system the less seam work to do on the casting. 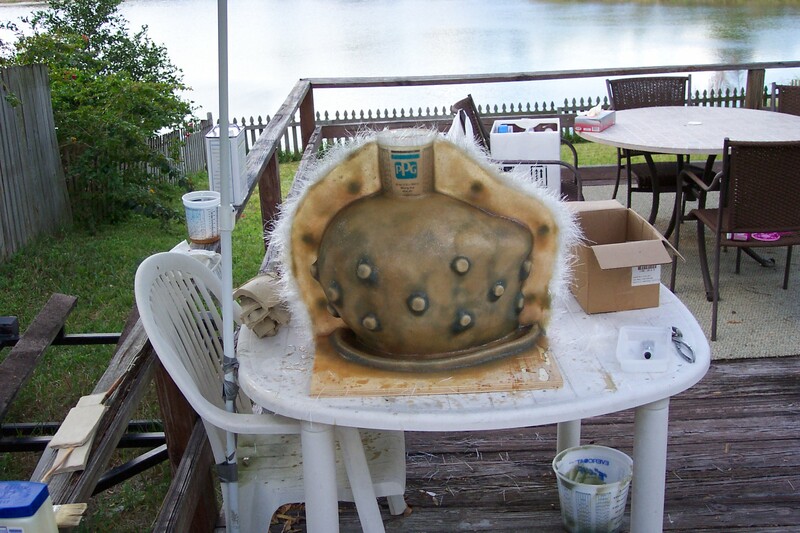 1st layer of silicone for front half of Skull Knight breast plate armor brush mold. 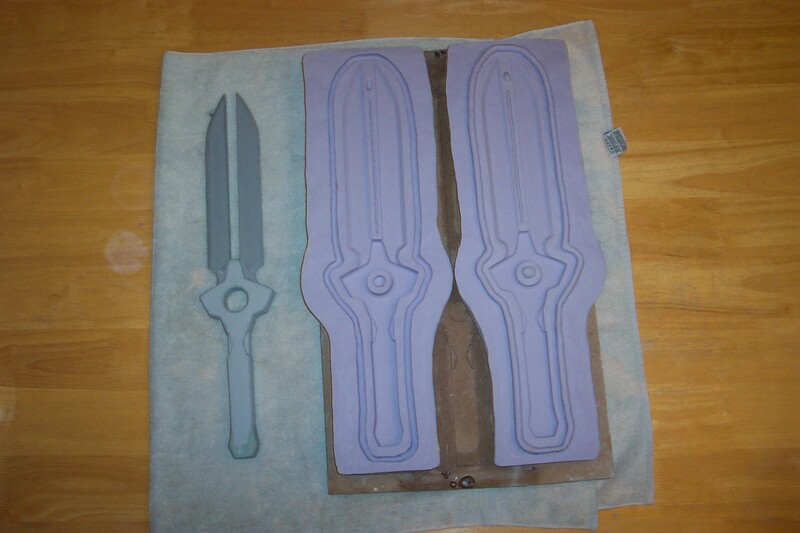 Case molding is a more complicated way to make a mold, but done right will save on rubber material and give you better quality pulls with less finish work to the final casting. If done properly, it may preserve the mold longer and you can get more pieces out of it. 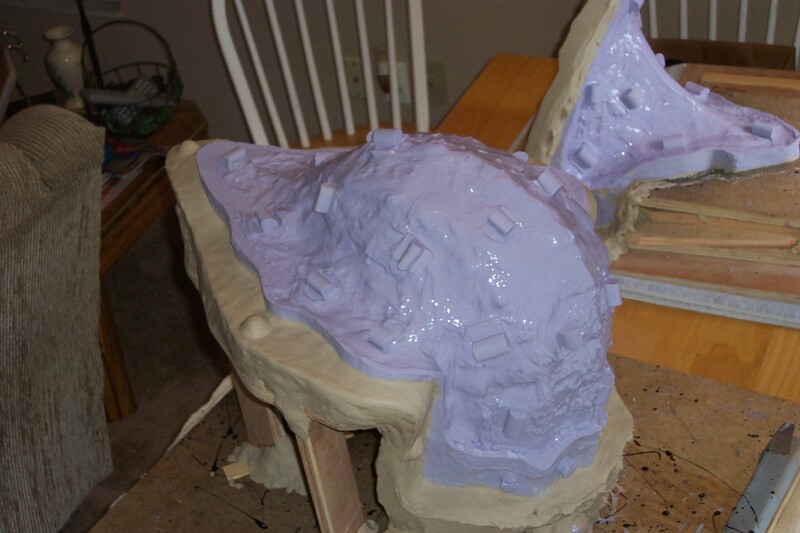 It’s more complicated because of the many extra steps that are needed to complete the mold. Most important is make sure the original sculpture is fastened to the surface (pre-determined board) and NEVER MOVES THROUGHOUT THE ENTIRE PROCESS. Protect the sculpture with plastic wrap/foil to help keep any clay residue from getting on the sculpture. If the sculpture is made of clay, be careful not to press hard against it as you work on the mold so you don’t damage any detail. I usually spray a couple layers of high gloss clear over the sculpture to help give it a “candy coating” mini shell for added protection and smoother surface that will show up in the casting. 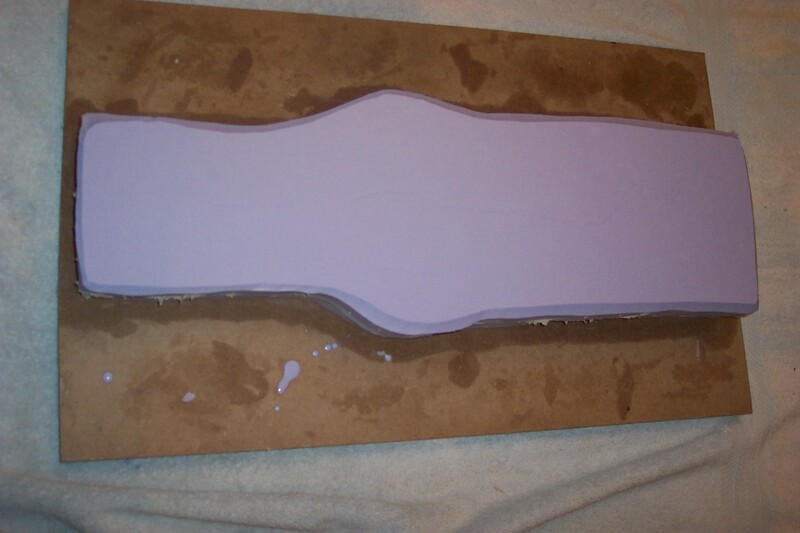 Cover the board and clay with wax or a good mold release. 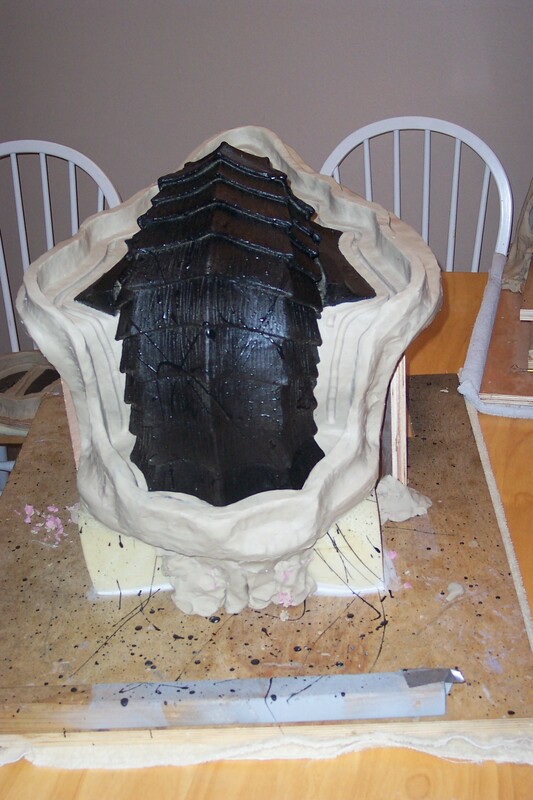 Lay up the first half (or all if only one full shell needed) of the mother mold over top of the clay as a medium to thick layer of fiberglass or desired hard strong substrate and allow to harden completely. Create a flange on the board as well. Lay up the second half after removing the clay or whatever you used to represent the dividing wall and waxing the first side that has hardened already creating a flange on the board as you did with the first half. After the shell is done and you’ve waited a good while for the mother mold to cure completely, drill some registration holes and screw the hard flange of the mother mold to the board the whole mold is built on. This step is VERY important so you know exactly how to put this shell back over the sculpture without any of the 3/8 inch thick clay added earlier. Remove the mother mold and then remove the 3/8 inch thick clay that was added earlier. This clay was there to represent the shape and space the liquid rubber was going to take up during the poring process. 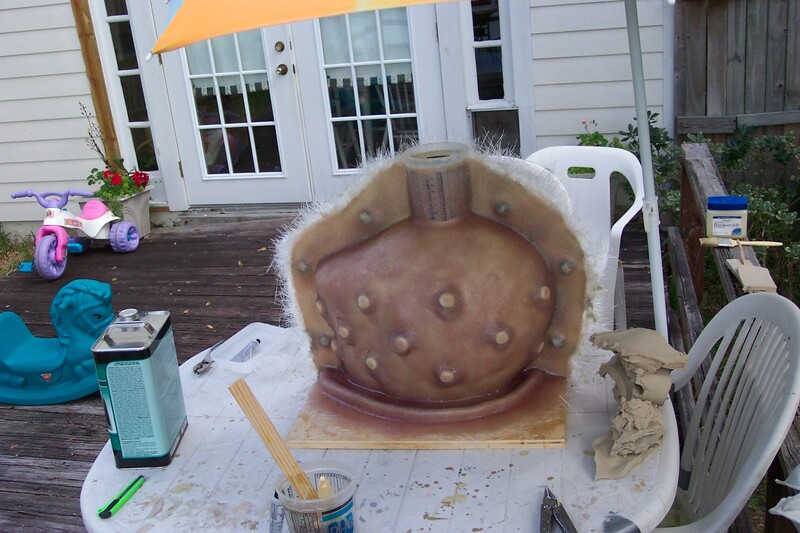 Before placing the shell back over the sculpture, drill tiny (1/16″) holes in several strategic spots on the mother mold as vents, so you can see the liquid rubber fill and push air out through the shell. 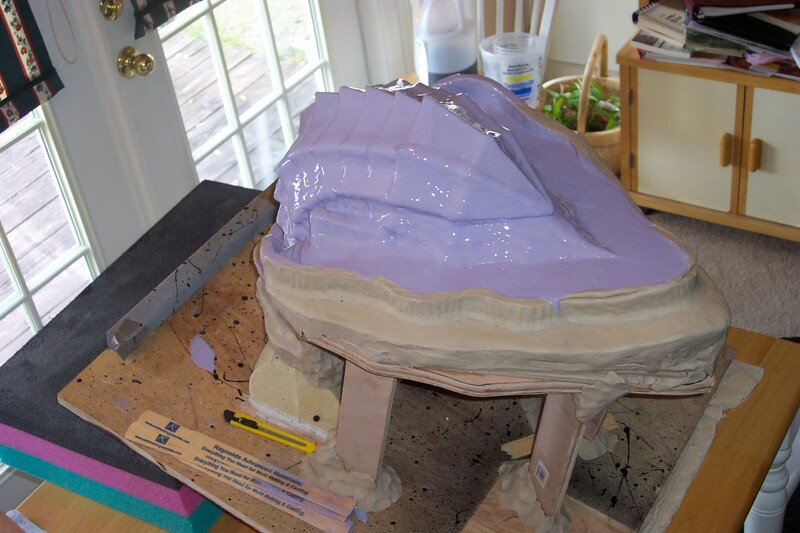 Relocate and place the shell back over the sculpture, that hasn’t moved, and secure the mother mold down tight on the board and screw or bolt the wall flange together if it’s a two part mold. Mix the liquid rubber substrate according to the specs of the product. It is highly recommended that the liquid rubber is put through the process of removing air out that was forced in during the mixing process before poring into the mold. This is done with a vacuum pump and chamber. This is optional but desired for a stronger, cleaner and better mold. 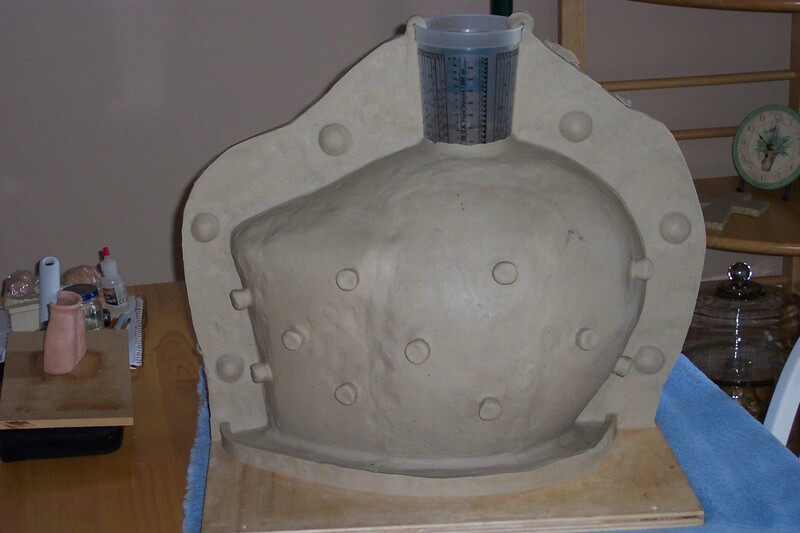 Poor the mold material slowly and push clay over the 1/16″ holes as they begin to have the liquid substrate begin to seep out. In fact you can use clay to cover up any areas that may not have been well secured to prevent loss of mold material. 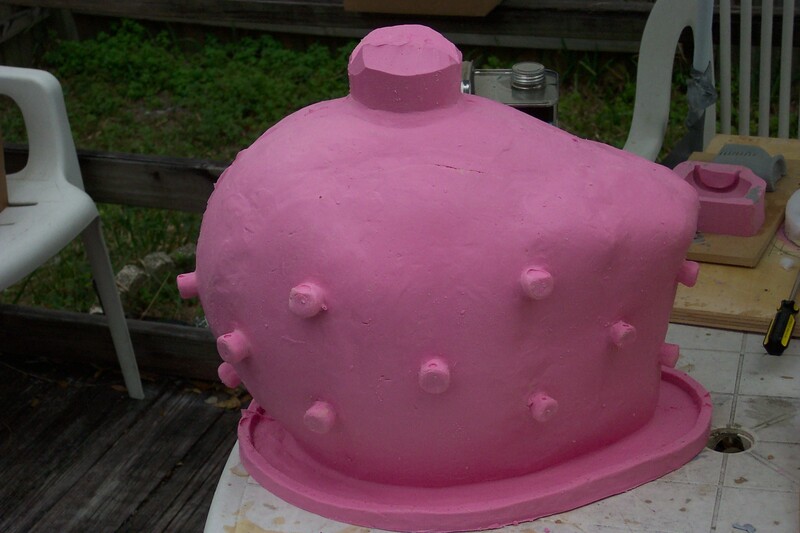 After the mold is filled to at least half way up the funnel spout, wait a full 24 hours or however long the product specs suggests for curing time before demolding everything. Take it all apart and you may have to cut a sizable slit along any inconspicuous areas (the back) of the rubber to help remove it from the original sculpture. Don’t worry about the cutting as the rubber will relocate exactly where it needs to be with only a minor line showing as it sits back in the mother mold. Easy clean-up or finishing on the casting. Hard molds, if cared for properly, can last a long time and withstand several more parts pulled out of the stiffer and stronger mold then it’s counter part as a flexible rubber mold. 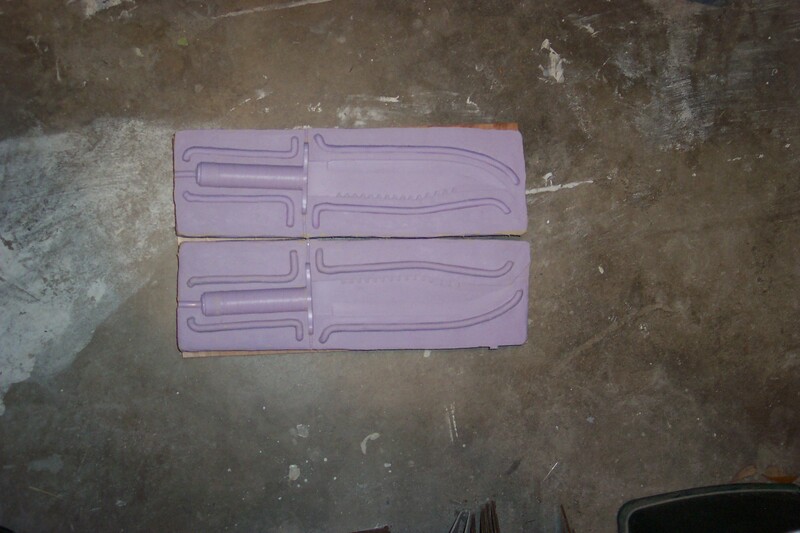 The rubber will break down over time, whereas the hard mold could last as long or longer then the maker attends it to. 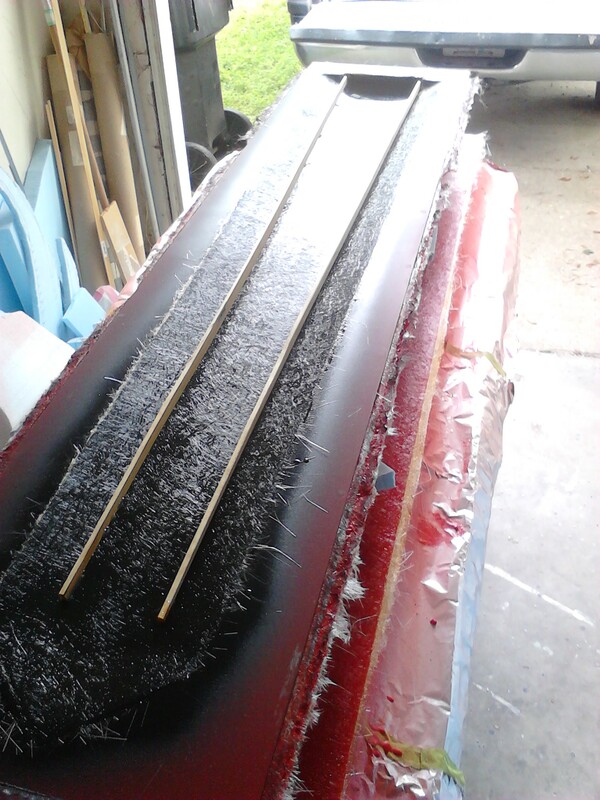 My personal choice of material and kind of hard mold is the fiberglass mold. 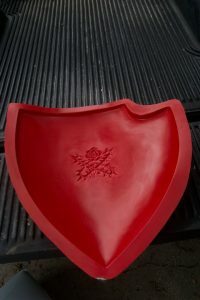 My experience has led me to believe the fiberglass mold is the most versatile and more widely used type of hard mold to be had. It’s strength, when thick enough, is uncanny and has countless uses and sizes for differing mold applications. 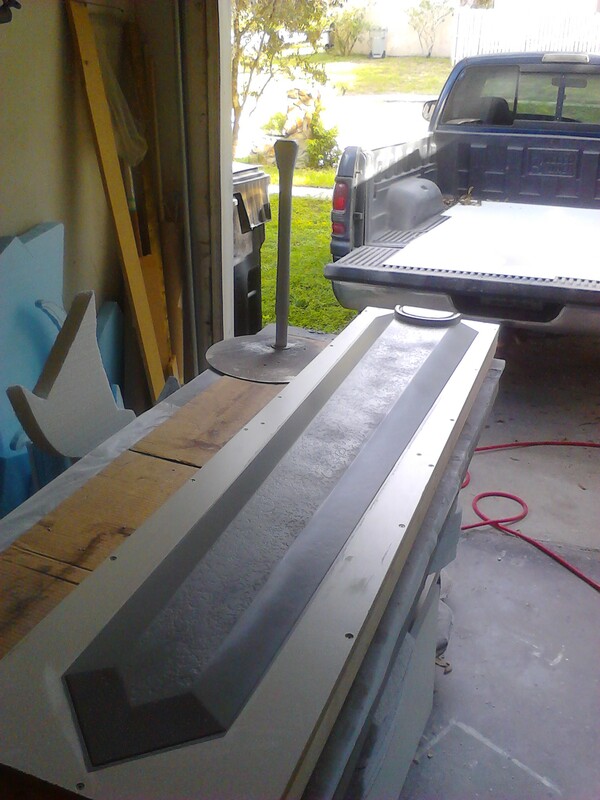 One famous type of fiberglass hard mold is with the manufacturing of medium and large boat hull fabrication. The hard mold will always keep its shape with minimal shrinkage and will last multiple parts pulled without losing any integrity if a consistent release agent is used each time. 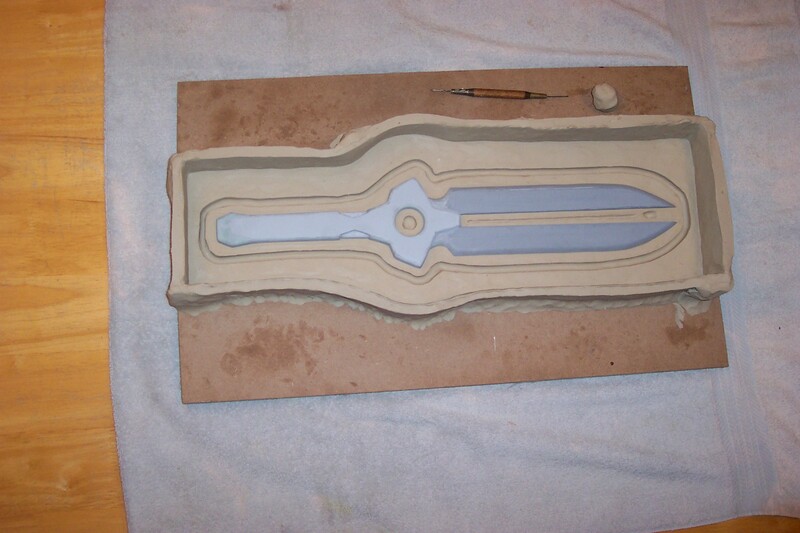 One very important factor to be taken into account when deciding on a hard mold is that the sculpture or piece to be molded CANNOT have any undercuts or difficult shapes that fold over to create a “lock” making it impossible to demold a rigid piece from the hard mold, as the two (mold and plug) lock together. 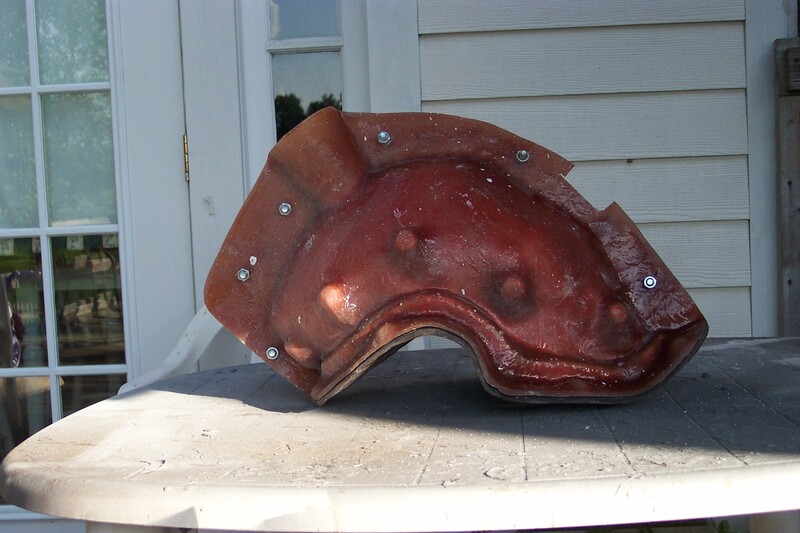 See pictures below for examples of fiberglass hard molds I’ve made in the past. 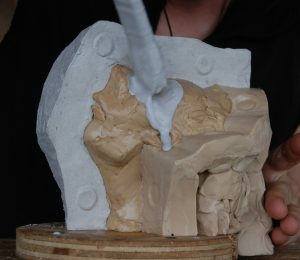 Plaster molds combine both the brush molding technique with the characteristic of a hard mold. It can also be pored as well, but most of my experience has been to brush mold to control air bubbles on the detailed surface for quality assurance. 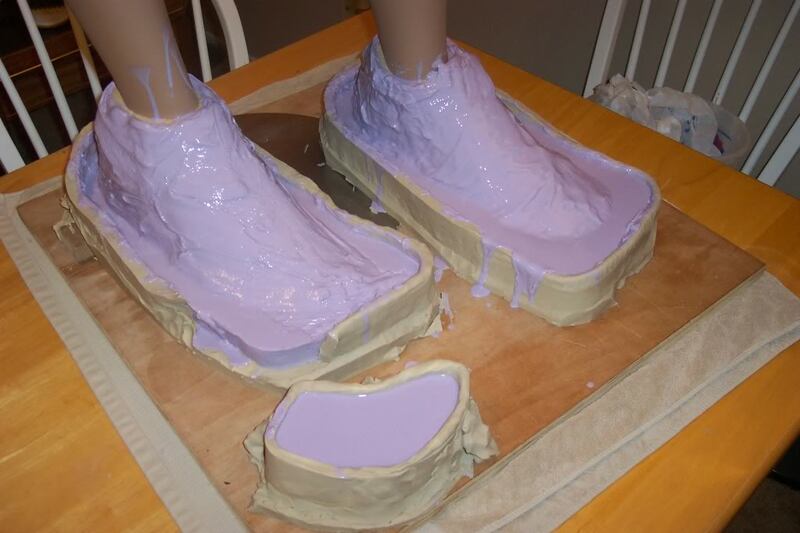 Plaster molds are excellent for casting non-rigid materials in, like latex for mask making. The detail the plaster mold captures is remarkable and therefore transfers onto the casting for an amazing end product. 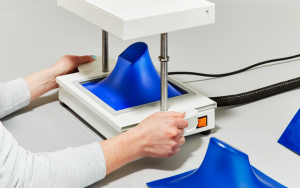 Vacuum forming is probably the least type of method used for mass production at home since it requires a system and/or machine that just isn’t economical or reasonable for personal use. However, if I had the room and funds, it would be a top ten purchase for me as I would invent uses just to have one–cause it is a fun thing to do. Vacuum forming is, as it says, forming a sheet of a thin plastic type of material over an object of desired shape by use of heat and suction. The simpler the shape with no undercuts or “locks” the better. So, I would say that this type of molding is opposite of what one is used to, as the part to be kept from the mold is made on the outside of the plug. More like taking a skin from the shape that is desired. The first thing that comes to my mind as a popular use for vacuum forming is with clone trooper armor and storm trooper armor. 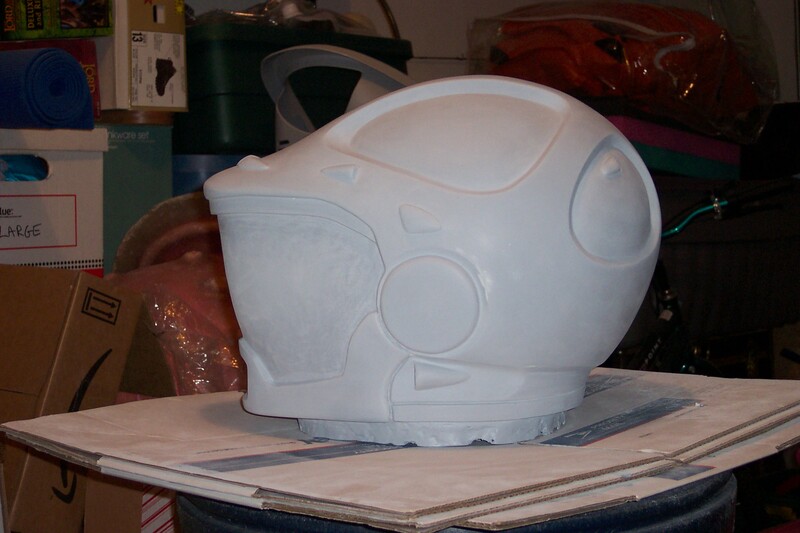 And my own experience with vacuum forming is when I had to make lenses for the Viper helmets I was making during my time with commission work. I confess that I’ve used this method more times than I’ve should, but it’s just as effective with results and gets the job done with little cost at all. You can call this the disposable mold method, where the mold is just a one time use only. The disposable mold type I’ve used the most is the “press” method. The press method is when you push a shape into clay and make an impression of the object you use to create the desired negative…(i.e. bolt head, half round, etc). You can press the shape as many times as you want side by side and produce a gang mold of several of the same shape if you need many castings of the same thing. 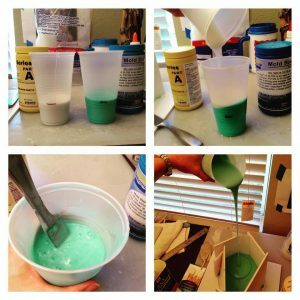 A good tip to know also, as a cheap simple method, is the use of clear silicone caulking as a substitute molding substrate. 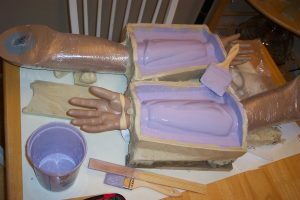 All you need to do to speed up the hardening is a shallow bucket of soapy water and inject the desired amount of caulk in it and mix it up in the water and apply quickly to the plug or piece to be molded–mold is done, add mother mold if needed. 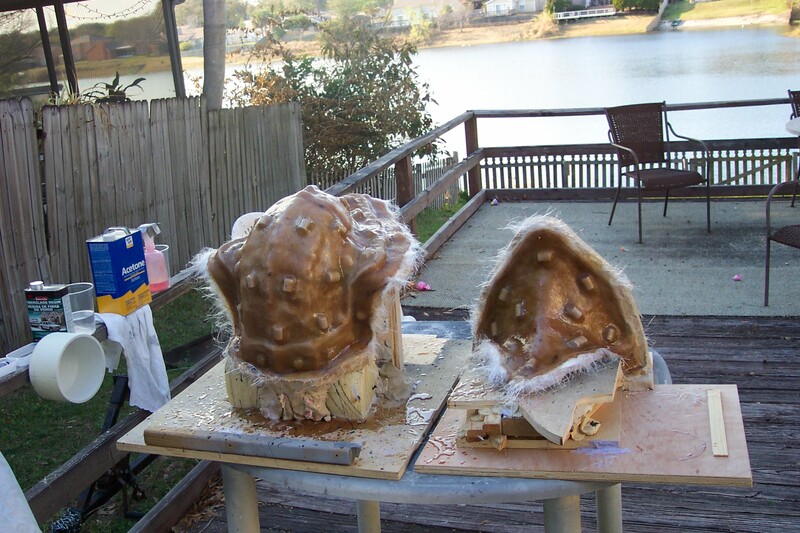 I’ve even used this method as a casting material for a fake, soft rubbery brain that I made using a pre-made jello mold. 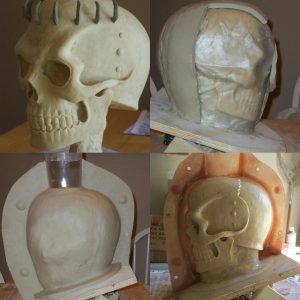 I know there are other mold types I haven’t discussed here, but these are the most popular and the ones that I’ve used the most–so I hope you can take advantage of these methods and stay posted as I will do more detailed and elaborate instructions for each type in the Tutorials section here on my website. Thanks for hanging out…so until next time, happy crafting!